Fine Gael leader Enda Kenny says he didn’t travel to Brussels to negotiate, but did not indicate if Barroso had suggested rengotiation was on the table. 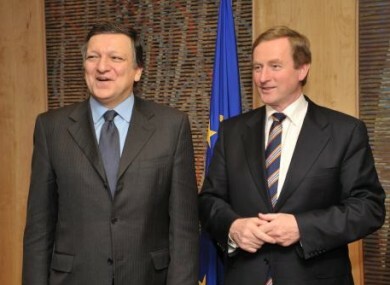 Jose Manuel Barroso and Enda Kenny this evening in Brussels. FINE GAEL’S ENDA KENNY and Michael Noonan have met with the president of the European Commission this evening to discuss Ireland’s EU/IMF bailout agreement. The Fine Gael politicians had been expected to discuss the interest rate being charged for Ireland’s financial assistance package. Speaking after the hour-long meeting with Jose Manuel Barroso, Kenny said it had been a “very good meeting”. He said Barroso was “very strongly supportive” of Fine Gael’s position on fiscal policy, but did not say if the president had indicated the bailout’s interest rate could be changed. Kenny said the Commission had to deal with the government that was “in situ” and his party was committed in government to renegotiating the deal. He said he had not travelled to Brussels to negotiate the interest rate or individual elements of the package, but looks forward to returning for further meetings if given a mandate by the Irish people. Fine Gael spokesperson for finance Michael Noonan has said Ireland will not be able to meet the repayments on the EU/IMF bailout deal unless more favourable rates are negotiated. This evening Noonan said new fiscal rules will have to be implemented in Ireland to curb reckless lending from financial institutions. He said the party’s position on the debt was that the country had to honour in full all its sovereign debt and guaranteed bank debt. He said Fine Gael has always argued there should be some burden-sharing over the €15bn unguaranteed debt, but that must be dealt with in the context of Europe as a whole and under the umbrella of the ECB. The likelihood of renegotiating the deal is unclear. International investor George Soros told Bloomberg yesterday that Europe is, on balance, moving forward as the faster-speed tier led by Germany is moving at a high enough pace to carry the slower-paced countries, including Ireland, along. However, he said Ireland cannot wait until 2013 to restructures its debt and it is putting Europe “on notice” that it will want to renegotiate its funding agreement when a new government is in place. Soros said it is “patently unjust” that the Irish people should absorb all the losses made by the banks while the bondholders are free. Last night RTÉ’s Prime Time aired an interview with a senior ECB official who said the deal had already been made and must now be implemented. Contrary to Fine Gael’s view, the ECB’s Lorenzo Bini Smaghi said that the bailout deal had passed through a democratic process which would not be re-done if the government changes and the next government decides to renege on the agreement. Earlier today, Green Party senator Dan Boyle said he was surprised and bemused to hear of Kenny and Noonan’s meeting with Barroso. Boyle said Enda Gilmore and Labour’s Eamon Gilmore declined to meet with EU Commissioner Olli Rehn when he visited Ireland in November ahead of the EU and IMF agreement. Difficult choices have to be made, and Enda Kenny needs to spell out a coherent economic plan, and show some level of economic competence and understanding. He has yet to do so. And when it came to the crunch, he ducked his responsibility last November as the opposition leader, to have meaningful engagement with the European Commission at a time that really mattered. Fianna Fáil TD Darragh O’Brien also criticised the trip, saying it was an “empty public relations stunt designed to present him as a leader without exposing him to a real debate over his policies”. Responding to Boyle’s comments, Fine Gael senator Liam Twomey said the Green Party senator appears to have “forgotten that he was a member of the government which ruined the economy, brought Ireland to its knees and called in the IMF”. Email “No negotiation on bailout deal for Fine Gael and Barroso”. Feedback on “No negotiation on bailout deal for Fine Gael and Barroso”.